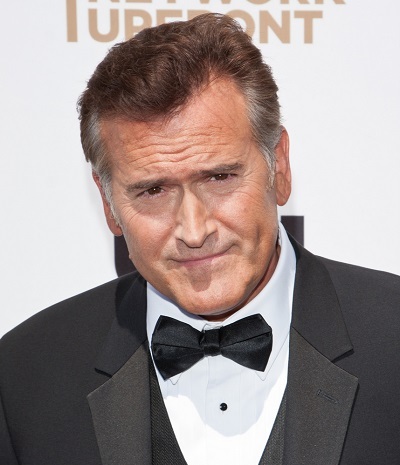 Place of Birth: Royal Oak, Michigan, U.S.
Bruce Campbell is an American actor, comedian, director, writer, producer, and author. He is the son of Joanne Louise (Pickens) and Charles Newton Campbell. Bruce is married to costume designer Ida Gearon. He has two children with his former wife, Cristine Deveau. Bruce’s paternal grandfather was Donald McKenzie Campbell (the son of Hugh Campbell and Ellen Mary Campbell). Donald was born in New York. Hugh was Scottish, the son of Hugh Campbell and Celinda Philany Harris. Ellen Mary was born in New York, the daughter of Peter P. Campbell and Margaret McKenzie, both of Scottish origin. Bruce’s paternal grandmother was Dorothy Durfee Newton (the daughter of Charles Damon Newton and Nellie A. E. Durfee). Dorothy was born in New York. Charles was the son of Daniel Newton and Polly Ann Brundage. Nellie was the daughter of Charlie/Charles Willis Durfee and Rose Henderson. Bruce’s maternal grandfather was Paul Raymond Pickens (the son of George Alfred Pickens and Perlina D. Gibbins). Paul was born in Ohio. George was the son of John William Pickens and Sarah Jane Adams. Perlina was the daughter of James Gibbins and Emeline Shields. Bruce’s maternal grandmother was Marjorie Louise Dooley (the daughter of Charles David Dooley and Grace Zeulah Walker). Marjorie was born in Ohio. Charles was born in Derbyshire, England, the son of Charles Dooley and Elizabeth Emily Potter. Grace was the daughter of Joseph A. Walker and Alice “Allie” Ward. The “Durfee” line has an ancient French Huguenot origin. Good thing he’s not Muslim. Am I right you racist? Not all Scots are of Celtic descent. And we DON’T all look the same. But as it happens there are lots of good looking Celts -Sean Connery, Pierce Brosnan, Errol Flynn, and probably hundreds more, who have lit up Hollywood.